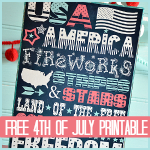 I had so much fun putting this printable together. I love subway art and I wanted to make for my home a print to decorate my entryway. I normally frame my prints but this time I chose to place the free printable on top of a piece of wood. 1. I trimmed the printable. Cutting an extra 1/4 inch from the sides. 2. I cut the length of a 1×8 piece of wood to match the height of my print. 3. My wood was already painted white so I changed the color to match the blue of my print. 4. I glued the print to the wood using double permanent adhesive. 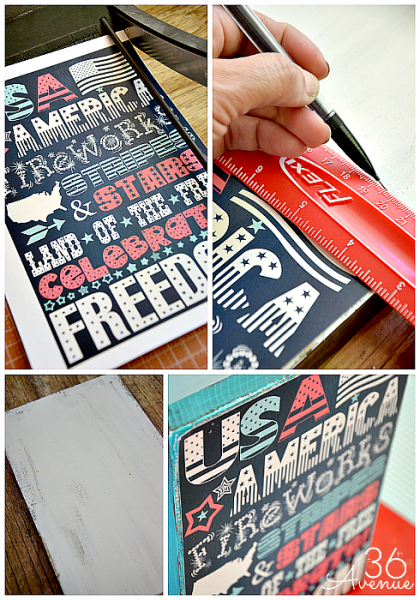 You can use Mod Podge to stick the two surfaces together… that would also look great! I love the way it turned out in the end! I hope you do since today I am sharing this free printable with you guys. Yeah… I love you that much! 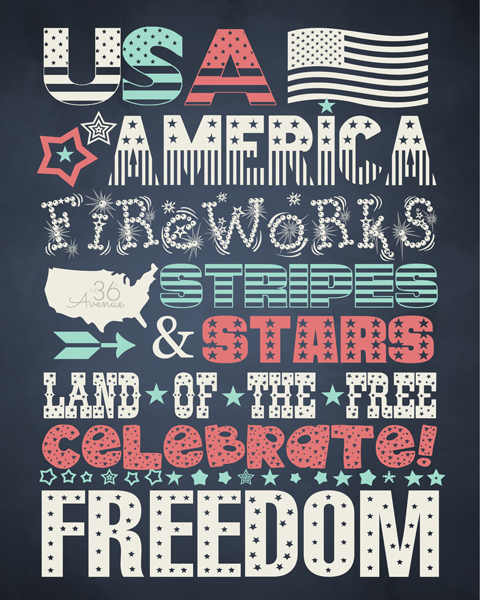 to these awesome 4th of July Free Fonts. and come on, they are free for goodness sake! 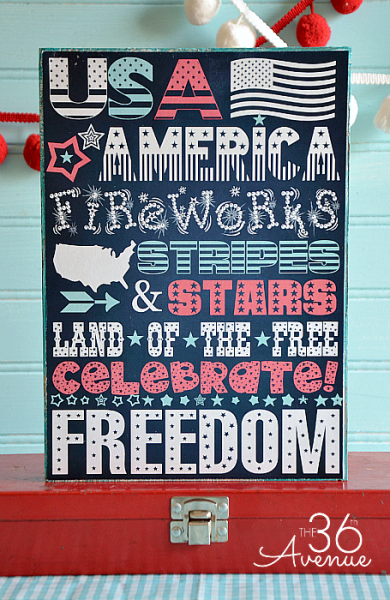 I hope you get creative and make some awesome 4th of July decorations of your own. and a few other projects that I need to finish… Stay tuned! I tried downloading this, but it says that it’s only 6×8 inches. Where can I get the 8×10 one? How do you get the printable? 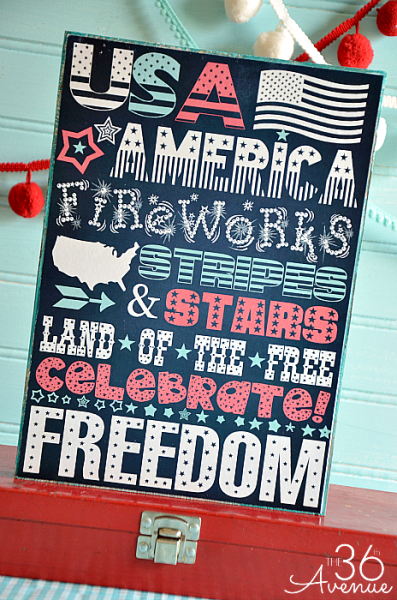 I love this printable, do you have it available for download as a 16X20? This is super cute. 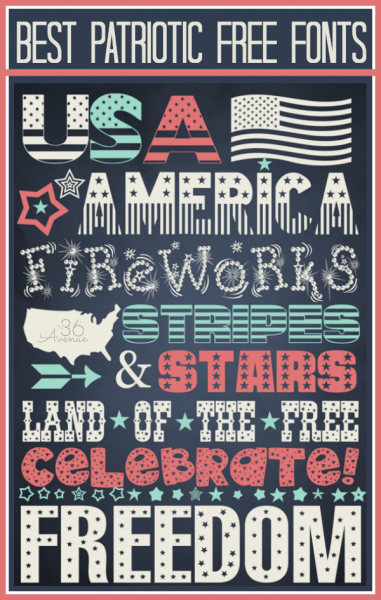 I downloaded Jana Sparkle and Shine – but it doesn’t look the same as the one you used for “FiReWoRkS” – did you do something to embellish the font? I used both, lowercase and capitals. Play with it and see it it works better. This is a beautiful piece of art!! I’m kinda in a July 4 mood myslef. So, so cute! Yes, I LOVE it! I really like how it looks on the wood. Thanks so much for the printable! Have a wonderful weekend! Love this! I am having a hard time downloading in 8X10 though. I get resolution warnings when I try to print it at Costco. Any ideas what I might be doing wrong? Kelly, you should be able to do it. Did you download it from Box? Do not save the image from the post. Make sure to click on the link to get the full size of it. I hope this works! Adorable! Pinned to my Old Glory pinterest board. Love it on the board- well done my friend! !